Whether you own a large patisserie chain or are an enthusiastic home-grown baker, the importance of weighing ingredients cannot be underestimated and usually marks the difference between resounding success and culinary mishap. An accurate baking scale helps ensure consistency that is essential for following complex recipes’ and producing baked products for commercial sales. This blog post will examine how and why weighing scales are used for baking and why they are essential for any catering business. What is a baking scale? A baking scale, also known as a catering scale, is a weighing machine used by bakers and caterers for measuring food ingredients. There are many types of baking scale on the market, from digital kitchen or cooking scales for personal use to commercial catering scales and checkweighers. Trade approved scales are required when selling baked goods by weight. Why can't I use a standard kitchen scale for professional baking? Whilst most standard kitchen scales are useful for basic food portioning and for weighing out ingredients on a small scale, they will not have the same level of precision as more specalist scales. Professional baking scales tend to offer higher precision, higher weight capacities as well as a whole host of additonal smart weighing features such as the ability to store and recall recipes. Patisseries and commercial bakeries need to measure large quantities of ingredients when mixing batches of baked goods. A professional baking scale can offer greater precision than the average digital kitchen scale, and some varieties feature trade approvals required for selling baked goods by weight. Weighing scales help ensure baked goods consistently turn out the same for each batch, which is important for a catering business. A standardised production process and using the same recipe means the finished product will be similar every time, which means customers can expect the same product when they return. When following a recipe, it’s important to measure ingredients accurately. For example, if a pizzeria doesn’t weigh pizza toppings, there’s a good chance the amounts of cheese or other toppings will vary for each pizza. You might order the exact same pizza, but if the flavour is different every time, you might be disappointed. An accurate baking scale ensures that the precise amount of each ingredient goes into every batch. See are article on using a scale for weighing pizza for more information. The decision to not weigh ingredients can also lead to an increase in product waste. Catering for events such as weddings requires intricate planning and precise ingredient weighing to ensure each portion is the same and at the same high standard. By using a scale, you can accurately divide the total weight of ingredients by the number of portions to ensure consistency per portion. There are many baking scales available, and each one offers different features, capacities and readabilities. It’s important to know what you need and want, along with how much money you plan to spend. How you intend to use your weighing scale is particularly important, especially if you own a commercial bakery, pizzeria or deli. 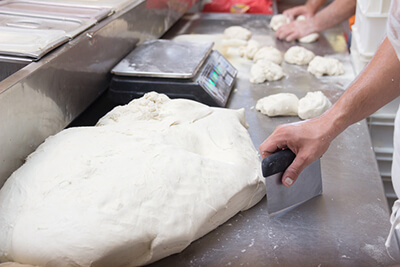 If you plan to weigh large amounts of ingredients all at once in a factory or commercial bakery, you will need a more robust, larger scale with a wider range of features than if you own a small baking business. Make sure the scale you choose contains the features and functions you need for your food-weighing tasks. A wide variety of food scales are available on the market; many offer checkweighing, parts counting and percentage weighing. Consider the importance of these to your business when making your decision. If you are selling baked products by weight, you will require a trade-approved scale. There are many varieties of trade approvals depending on the region, and it is important to check the approval status in your country before making a purchase. The overall price is a crucial part of the decision-making process when purchasing a scale. Feature-rich scales can be more expensive than the average digital kitchen scale. It’s helpful to approach price in terms of product value, ensuring you have a realistic budget in place that matches the product features you require. 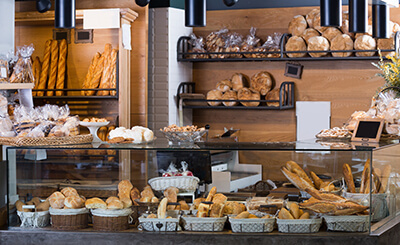 Bakery scales are essential for weighing large amounts of products commercially and can be used to reduce cost, minimise waste, and ensure product standardisation. Trade-approved baking scales are required when selling baked goods by weight. It is important to consider intention, features, approvals and product value when purchasing a baking scale. Adam Equipment's CPWplus range of weighing scales feature a smooth design and wide range of pan sizes and weight capacities. Constructed with a durable, flat stainless steel base that is easy to clean, CPWplus scales are ideal for weighing pizza and large cakes whilst applying toppings or decoration. The SJ-EC range of compact scales manufactured by A&D are suitable for any environment where space is limited. These scales feature a small, stainless steel pan that is easy to clean and can be used for weighing cooking ingredients and spices such as cinnamon and star anise in bakeries, as well as coffee, sugar and tea in coffee shops and baristas. The SJ-EC range is trade approved for selling products by weight. The WBW washdown scale features durable IP-66 rated housing and a stainless steel weighing pan for easy cleaning and operation in wet environments. WBW scales are portable and compact in design, suitable for weighing batches of ingredients in bakeries and home catering businesses. The WBW range also includes a series of WBW-M scales that are trade approved for selling food products commercially by weight. Kern's FKT bench scale comes with touchscreen operation and sensitive backlit display that is easy to read and operate. FKT scales come with a unique mixing and recipe recall and weighing features that are essential in pressured kitchen environments. These scales feature a stainless steel weighing pan and built-in checkweighing software for accurate ingredient weighing. EC class III trade approvals are available with some models. Adam Equipment's Astro range of compact scales are ideal for accurate portion control in restaurants and food outlets. These scales can easily fit on crowded workstations and can be stacked and stored away with ease. The Astro is a small digital scale suitable for weighing small amounts of baking ingredients such as flour, butter, sugar and cooking spices.